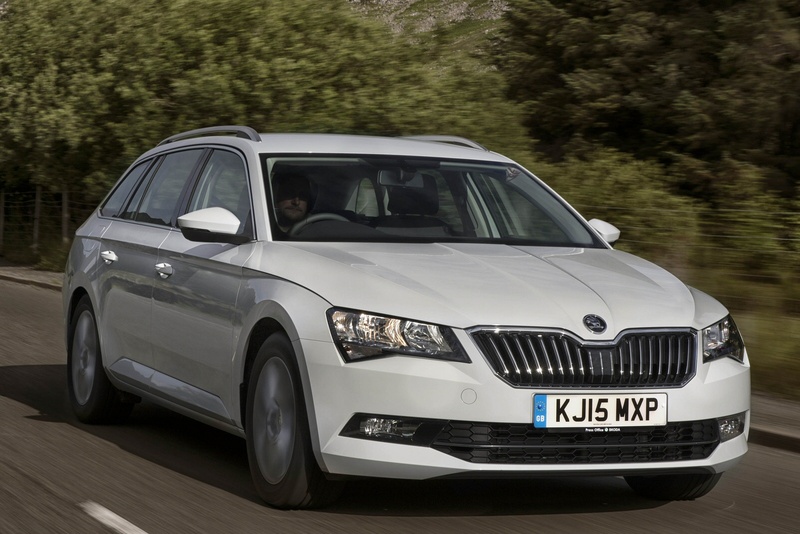 If you want a really big estate car that doesn't come with the kind of premium pricing you'd get with station wagons from Volvo or the top German brands, then here's not much to touch Skoda's Superb. This third generation version is even larger than its predecessor, yet more efficient and better equipped. If you're looking in this segment, you'd probably like one. 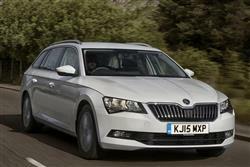 Skoda's Superb has always traded on being big. 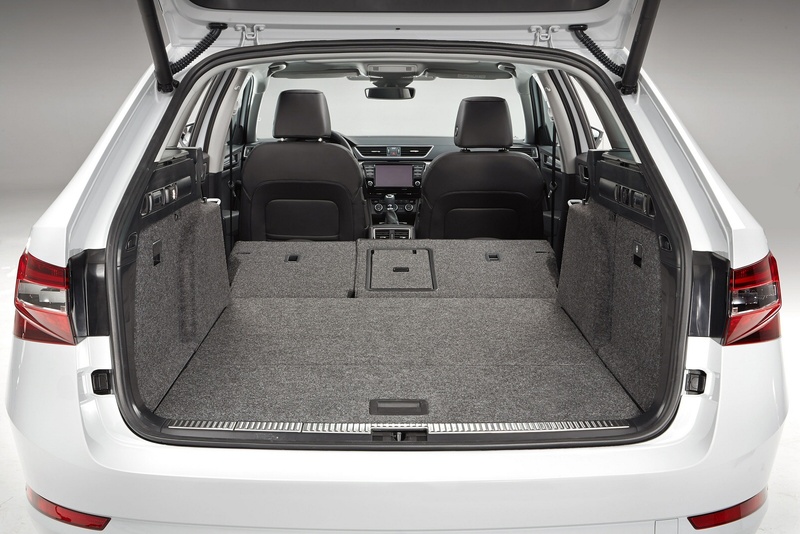 The standard hatch model's key showroom attribute has always been the astonishing levels of rear seat legroom it offers - plus its big boot. The car's always been the perfect starting point then, for the creation of a really huge estate model, something the Czech brand introduced with the second generation version and continues with here in this much improved MK3 model. This design uses the Volkswagen Group's hi-tech MQB platform, which allows it to be bigger, yet still lighter than its predecessor. Sure enough, there's a big 660-litre boot with the seats up and nearly 2,000-litres of space with the rear bench folded down. We're almost into large MPV territory here. Al this from a smart executive-style estate with no frumpy People Carrying connotations. 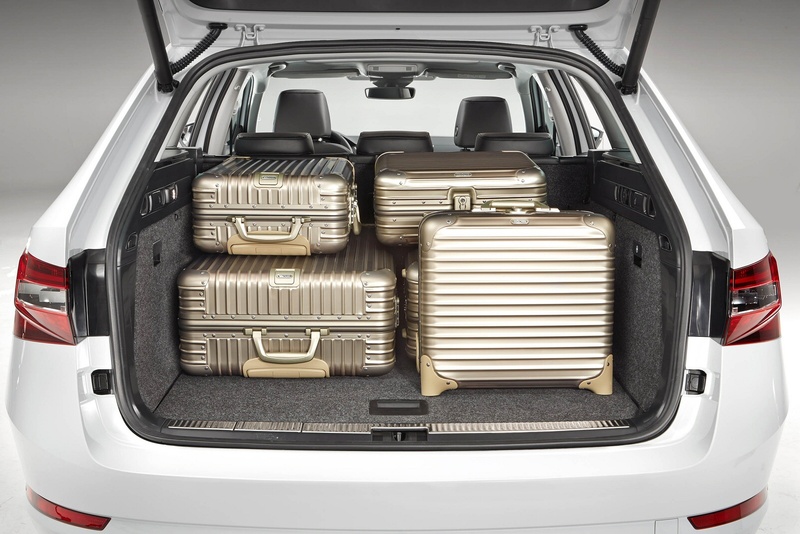 As before, it's priced at the level of a Ford Mondeo or Vauxhall Insignia-style 'D-segment' estate, yet offers even more room than you could expect from a much pricier large Executive class station wagon - say a BMW 5 Series Touring or an Audi A6 Avant. In other words, there's plenty to like here. 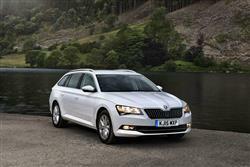 If you were to pick one word to summarise driving the Superb, you'd probably pick 'relaxed'. Weight may have been paired back by around 75kg for this MK3 model but it's still very big - and heavier than other cars that sell at a similar price point. If you push it, the Superb does handle tidily with plenty of grip, but you can feel that's not its preferred gait. This isn't helped by optional adaptive dampers which are too firm in 'sports' mode but allow too much body movement in 'comfort'. Try and hustle it along though and you're kind of missing the point of this car. As before, 4WD is an option on the larger engines - and standard fit on the flagship model, the potent turbocharged 272PS 2.0-litre DSG petrol variant. This pricey derivative's hard to recommend though, given this car's lack of sporting remit, intriguing though it is with what is effectively the powertrain from the Golf R hot hatch beneath the bonnet. The other petrol option is the 1.5-litre TSI turbo, offered with 150PS, a unit we'd recommend as it's notably clean and economic thanks to cylinder deactivation technology. If you don't do many miles, it's certainly worth your consideration. It'll be the diesels that the majority of buyers go for however. 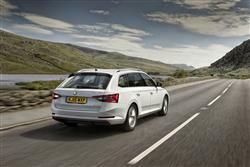 There's a 1.6-litre 120PS derivative, but most will opt for the larger 2.0 TDI variant that offers either 150 or 190PS. The 150PS motor is capable of a respectable 0-62 time of 8.9 seconds with manual front wheel drive transmission. 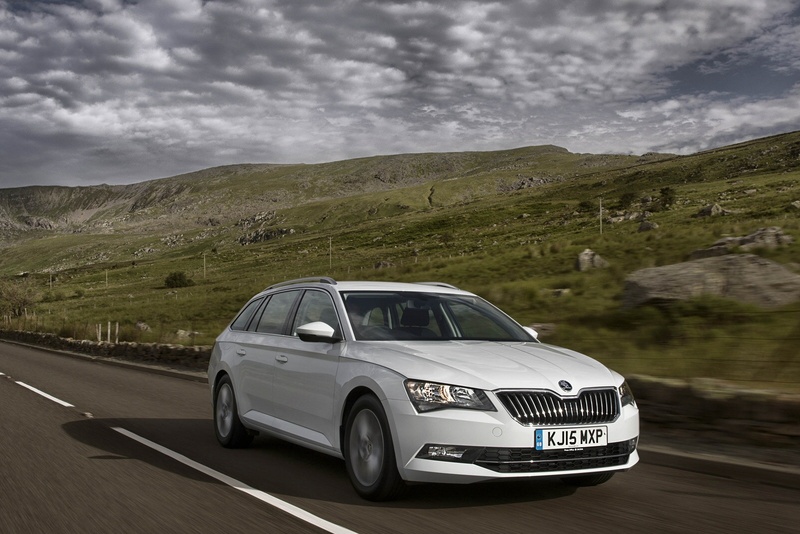 The third generation Superb design is more assertive and interesting than before, which may help in Skoda's quest to lower the buying age demographic a little. Up front is Skoda's smarter corporate grille, flanked by angularly confident headlights and sitting above a full width air intake. Dashes of chrome add to the classy feel as does restrained detailing on the sides of the vehicle. You'd probably never use the word 'stylish' in describing this car, but the overall looks are certainly handsome in a slightly Germanic way. The same observation applies to the interior and it's of unquestionably of high quality, with well-chosen materials and elegant design simplicity. Underneath this Skoda lies the Volkswagen Group MQB platform, the one shared with the smaller Octavia model as well as with cars like Volkswagen's Passat, SEAT's Leon and Audi's A3. Here though, that chassis gets a much longer wheelbase, this enabling this car to provide over a meter of legroom for rear seat passengers. 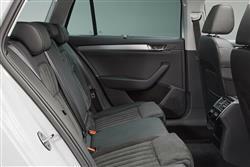 Only boardroom-sized Luxury segment saloons like Mercedes' S-Class can match that. Boot space is enormously large too - and bigger than before, 660-litres on offer with the seats up and a staggering 1950-litres available when the rear bench is folded down. Not even a huge Mercedes E-Class estate can beat that. 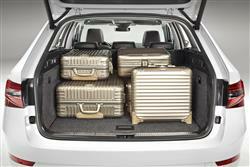 Not only is luggage area spacious: it's also a very useful shape. There's a low load lip for the wide tailgate that stretches almost the entire width of the car. And a boot with very little intrusion from the rear wheels and suspension. Potential Superb Estate buyers will not be short of choice. You're looking at having to find a premium of around £1,200 if you want this station wagon bodystyle rather than the standard five-door hatch model. That means price ranging in the £25,000 to £38,000 bracket through six different levels of trim. Most models come with DSG auto transmission and the more powerful engines get the option of 4x4 traction. All versions come decently equipped. Even at entry-level 'S'-spec, you can expect to find 16" alloy wheels, a leather multifunction steering wheel, a DAB radio with Bluetooth and a couple of audio inputs, plus a 5" touchscreen. The 'SE' grade gains SmartLink phone integration, dual zone air con, rear parking sensors, 17" alloys, cruise control and a 6.5" touchscreen. Even plusher 'SE L Executive' trim adds 18" alloys, Bi-xenon lights, electric boot opening, leather seats that are heated up front and an 8" sat nav and infotainment centre. Next up are 'SE Technology' and 'Sportline' variants. At the top end, flagship 'Laurin & Klement' trim gets a 10-speaker stereo, heated rear seats and a heated windscreen, plus 'KESSY' keyless entry, park assist and even a TV tuner. Safety is covered by the usual electronic aids, while more expensive models gain blind spot detection, lane assist and park assist. Those looking for the thriftiest model will look towards the 1.6 TDI diesel, a variant that even with auto transmission puts out only 113g/km of CO2 and manages up to 49.6mpg on the combined cycle. On paper this may seem ideal - but that kind of showing might slide if you regularly drive fully-laden. With that in mind, the 150PS 2.0 litre TDI diesel variant may be a better fit. With a DSG auto gearbox, this Superb will emit 115g/km of CO2 and manage 52.3mpg on the combined cycle, with the showing about the same if you opt for the pokier 2.0 TDI 190PS model. Add 10-12 g/km of CO2 to that figure if you opt for 4WD. 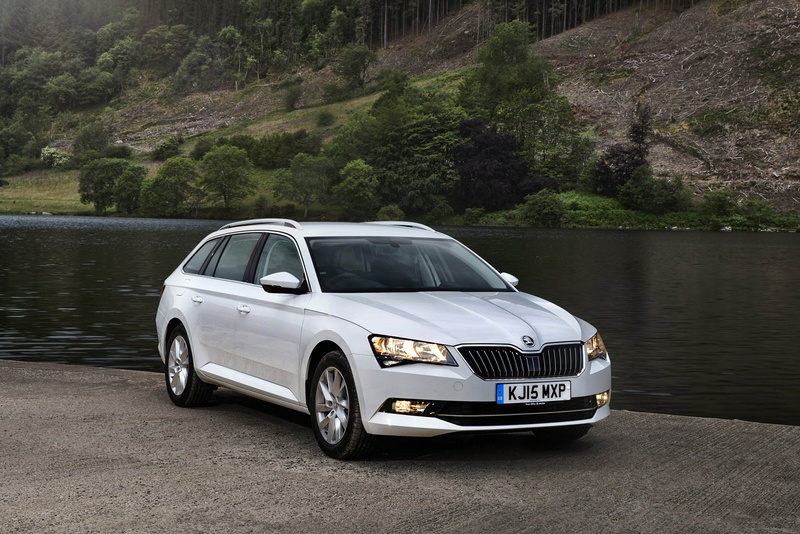 As with all Skodas, this one offers two years of unlimited mileage warranty, with a third year capped at 60,000 miles, though this package can be extended to five years and 100,000 miles for a reasonable £630. The Superb will hold its value best if you show some restraint when ordering; 'SE' trim will have all the kit you need and the 2.0 litre diesel will be the engine most sought-after on the used market. Used car buyers generally won't want a thirsty petrol variant. If you�re looking for a new SKODA Superb 1.6 TDI CR SE Technology 5dr DSG Diesel Estate for sale, you�ve come to the right place. At Bristol Street Motors we don�t just have the best SKODA Superb 1.6 TDI CR SE Technology 5dr DSG Diesel Estate deals, we also offer friendly advice and help with all your enquiries to ensure your buying experience is a happy experience.